Five Takeaways From Wednesday At The Republican Convention : It's All Politics Republicans united behind their nominees tonight, as they emphasized why they think former Gov. Mitt Romney and Rep. Paul Ryan are the best leaders for the nation. But there was much more to absorb from the evening at the GOP convention. Republican vice presidential nominee Paul Ryan and his wife, Janna (at right), along with two of their children and his mother, Betty, on stage Wednesday in Tampa. 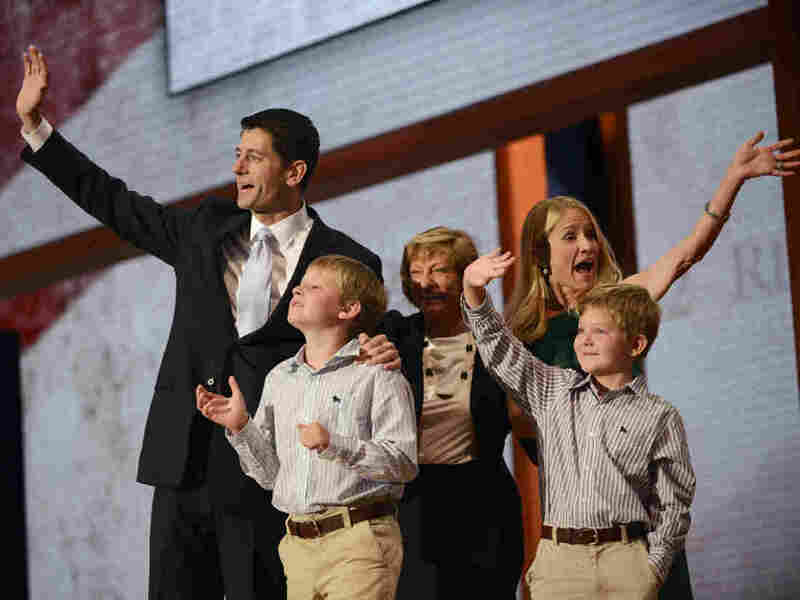 -- The Delegates Really, Really Love Ryan: Tuesday night, we said that about presidential nominee Mitt Romney's wife, Ann. It was certainly true again tonight for Ryan. Delegates were thrilled when he talked about his mom building her own business and then said she "is my role model." They roared when he said Democrats "have no answer to this simple reality: We need to stop spending money we don't have." And it was raucous in the arena when he said "college graduates should not have to live out their 20s in their childhood bedrooms, staring up at fading Obama posters and wondering when they can move out and get going with life!" It would seem this crowd very much approves of Romney's choice. -- 'We're United. Did We Tell You We're United? Well, We're United.' It was something of a parade of former rivals tonight who set aside their differences (and perhaps bit a few their tongues) to stand before the nation and declare their support for Romney. But former Arkansas Gov. Mike Huckabee might have lifted the curtain a bit too high when he said that "we have Barack Obama to thank" for bringing himself and others into Romney's tent. In other words, one big reason they're so united is how upset they are with the Democratic president. -- There's Nothing Wrong With Success: Along with "you did build that" and other refrains, a common thread through tonight's speeches was that it's OK to be smart, successful and rich. "Success is the American dream," said New Mexico Gov. Susana Martinez, "not something to be ashamed of, or to demonize." Speaking of the very wealthy Romney, Ryan said that the presidential nominee "helped start businesses and turn around failing ones." Then, he added to loud cheers, "by the way, being successful in business — that's a good thing." There's a strong sense among the Republicans here that President Obama and his fellow Democrats want to penalize, not celebrate, those who are successful in business. -- Guns And Grit: There's nothing like mentioning that you've carried a gun (as Gov. Martinez did) or that you had the grit to rise above tremendous challenges to get these delegates on their feet. Former Secretary of State Condoleezza Rice electrified the room when she talked of being a little girl who grew up "in Jim Crow Birmingham — the most segregated big city in America" to become the nation's top diplomat. It was her parents, she said, who made her believe that though she couldn't "have a hamburger at the Woolworth's lunch counter" she could become anything she wanted. -- It's Hard Being The Previous Nominee: Four years ago Sen. John McCain of Arizona was his party's presidential nominee. Tonight, on his 76th birthday, he got a polite reception and sendoff but couldn't seem to get the delegates' attention with his foreign policy-oriented speech. But "the maverick" did his duty for the GOP. "I trust" Romney, he said seven times during his address. And with that, he departed the stage. As we said earlier, "this just wasn't his show."